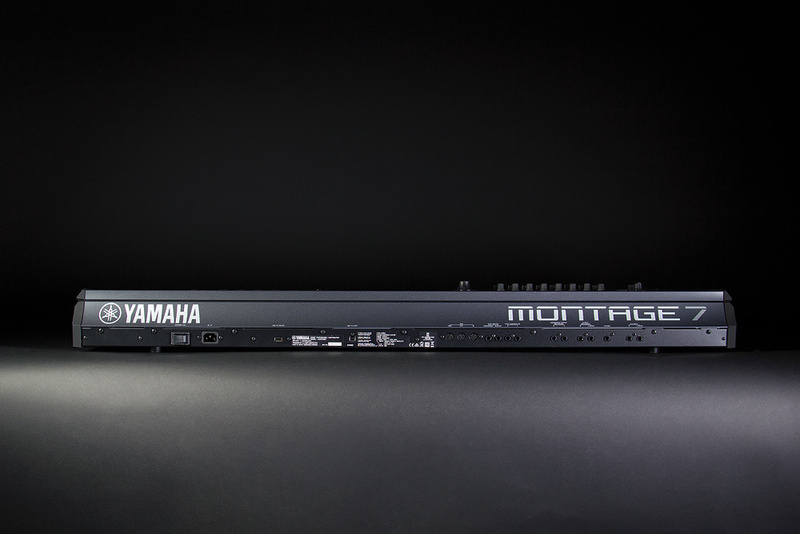 As its name implies, the Montage combines multiple technologies within a single, powerful instrument. But does it have what it takes to be the market leader Yamaha want it to be? Yamaha were once the unassailable titans of polyphonic synthesis. In the 1970s, the GX-1 and then the CS-80 defined the forefront of analogue synth development before, in 1983, the company almost single-handedly destroyed the market for large analogue polysynths when the DX7 swept aside the likes of Prophet 5, the OB8, and the Memorymoog. But in the late ’80s and ’90s the company seemed to lose their edge. 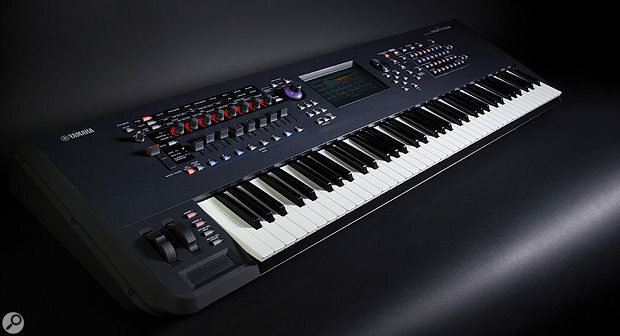 Further releases suffered at the hands of the Roland D-50 and the Korg M1, followed by the Kurzweil K2000 and the Korg Trinity. More recently, the Motif and its many spin-offs have been hugely successful, but even the most powerful of these were eclipsed by the Korg OASYS and Kronos. There had to be a time when Yamaha would attempt to reassert their authority and, when launching the Montage, the company were clear that this had been designed to be ‘the’ flagship synthesizer of the current era. Almost inevitably there were a few niggles with early units and, with some patches, some players reported a small latency between pressing a key and the onset of the sound, But any initial problems appear now to have been eliminated. With new firmware that includes sounds, additional effects, more flexible modulation routing, and additional programming screens and facilities, Montage v1.5 now seems ripe for review. Perhaps the most important thing you need to understand about the Montage is that it’s a synthesizer rather than a workstation. It offers two sound engines (AWM2 and FM-X) that you can use separately or combine freely in composite sounds and multitimbral setups, plus highly evolved arpeggiation, multitimbral effects and a basic MIDI recorder, but no sampling capabilities and no audio/MIDI sequencing. I have often wondered whether the world needs another synth with an on-board sequencer that will be ignored in favour of the likes of Digital Performer, Logic or Sonar (it doesn’t), so I am delighted that Yamaha’s programmers have invested their time and expertise on its sound. Although it is 16-part multitimbral, there’s no ‘patch’ level for programming sounds: everything is done at the Performance level, which combines sound selection, editing, mixing, multitimbral assignments, and much more. I applaud this. In the past, when memory was neither plentiful nor cheap, the common architecture was to create individual sounds in a Patch or Program mode, and then combine these into more complex Multis/Combis/Performances that comprised numerous sounds split or layered across the keyboard, or arranged multitimbrally, as required. The problem with this was that, if you changed one of the underlying sounds to achieve a desired result in a given Performance, you would damage any others that used the same sound. By dispensing with the Patch mode and programming all of the sounds (up to 16 of them, called Parts) within each Performance, the Montage sidesteps this and you are able to edit freely. The Montage’s 128-voice, stereo AWM2 sound engine has been expanded to hold an equivalent of 5.67GB of waveform memory which, Yamaha tell us, is more than seven times that of the most recent Motif, the XF. Perhaps more impressively, it’s 67.5 times the memory of the original Motif! As before, an AWM2 Part can comprise up to eight Elements, each of which is a synthesizer in its own right comprising a wave, your selection from 18 resonant filter types, an audio amplifier, an LFO, multiple contour generators and a dedicated EQ. If you have the inclination, it’s worth experimenting with single-Element Parts — you might be surprised at what you can achieve. Then, when you’ve gotten to grips with a single Element, you can start combining Elements to create the complex sounds for which AWM2 is famed. The Montage’s drum sounds are also sample-based, and you can distribute up to 73 of these across the keyboard from C0 to C6, no matter which model of Montage you have. The programming system is extensive, and you can apply the full force of the effects engine (which we’ll address in a moment) to the assembled kit. Having done so, you can arpeggiate the final sound to generate a huge range of high-quality patterns. Even more pleasing (for me) is the inclusion of an eight-operator, 88-algorithm, 128-voice FM engine. I’ve long been a fan of Yamaha’s FS1R rackmount synth and, while FM-X isn’t identical with this (in particular, it lacks the formant waveform and formant sequencing) it’s similar in many other respects. If your last encounter with FM was a DX7 or one of its immediate derivatives, you’ll likely view it as both hard to comprehend and incapable of warmth. If so, FM-X is going to come as a surprise because the Montage’s GUI makes it much simpler to grasp, and the resulting sounds can be unrecognisable from vintage FM. Nonetheless, the underlying philosophy remains the same as in 1983; you select an algorithm that determines how the available operators affect one another, and then affect their pitches and amplitudes to determine the initial sound and how it evolves. Of course, the Montage (like the FS1R) has more algorithms and more operators with more waveforms and esoteric parameters such as Spectral Skirt and Spectral Resonance (which I’m not going to explain here) but there’s still much that’s familiar. What’s not the same are the filters that allow you to shape the resulting sounds in ways that the DX7 could never imagine. True, FM-X doesn’t allow you to create your own algorithms, but somewhere in those provided you’ll find one that offers the relationships that you want. Even if you don’t, the possibilities already on offer are so extensive that they will keep you occupied for, well... perhaps the rest of your life. Before reaching the outside world, the outputs from the two synths engines have the opportunity to pass through the Montage’s capacious effects section. I have to compliment Yamaha on their decision to make these effects truly multitimbral, with a three-band parametric EQ, a pair of dedicated insertion effect slots, and then a two-band parametric EQ for each of the Parts and for the external audio input. Then, in addition to the 34 inserts slots and EQs, there’s a system effect block containing a further ‘Variation’ effect and a reverb, and then a master effect block... and a final five-band master EQ. It’s a superb system, now with 81 effects types available for each of the insert effect slots and the Variation slot (there were 76 types before the update to v1.5), plus 12 reverb types for the system block, and 15 effects types for the master block. These include just about everything you might want, with reverbs, delays, choruses and ensembles, flangers and phasers, tremolos, a rotary speaker effect, amp modellers, compressors, wah-wahs, lo-fi effects, and numerous special effects including a ring modulator, dynamic filters, enhancers, a pitch shifter, and more. Again, it’s unlikely that you’ll ever run out of options and interesting things try. The Montage’s arpeggiator offers an extensive range of parameters — so much so that I feel that the name Arpeggiator is inappropriate, and I would have been happier to have seen Yamaha describe it as a polyphonic pattern generator, or something similar. There are around 10,000 factory programmed arpeggios, divided into 18 categories, and further sub-divided into 25 sub-categories based on musical genres, and you can also store up to 256 of your own. There are two types of arpeggio — fixed patterns for drums, and those that respond in the traditional fashion to the notes that you play on the keyboard — and you can use the knobs to control aspects of their playback, use velocity to control accents, insert special effects such as key-off and string-release noises to make performances sound natural, and even use scenes to access different arpeggios for a given Part. You can play up to eight arpeggios simultaneously and my initial experiments supported Yamaha’s claim that you can use these to build backing tracks within the Montage itself. I was also delighted to find that you can configure the Montage so that the arpeggiator lies before the MIDI out. This means that you can direct the patterns to other synths and, most interesting, to your DAW so that you can record them as parts of more extensive compositions. Given my limited drumming skills and the quality of many of the drum arpeggios, I suspect that I would be doing this on a regular basis. Yamaha also make a big deal of the Montage’s Motion Control System, describing it as “a completely new feature... dramatically and dynamically altering the sounds of the instrument in new, never-heard-before ways.” To be fair, many players are going to love the combination of the Super Knob, motion sequencing and envelope followers but, at first, I could see nothing ground-breaking here. Then I discovered that you can use Motion Control to modulate FM-X operators; for example, using rhythmic sources such as arpeggios, drum patterns, and the changing amplitude of external audio as modulators. Suddenly, ‘never heard before’ started to seem possible. The most visible facility in the Motion Control package is the large, brightly lit Super Knob that dominates the area next to the screen and simultaneously controls any parameters assigned to the eight control knobs on the panel. While this might look good on a low-cost synth, it initially seemed incongruous on something as ‘pro’ as the Montage. But, as I grew accustomed to it — and especially after I discovered how to turn off its flashing — I stopped seeing as a carbuncle and started to recognise it as an easily located and easily grabbed performance control. Even more interesting (and useful) for me is the fact that you can control it using an expression pedal, which is going to be a boon for people who don’t have three hands. Next comes the 16-step Motion Sequencer, which allows you to manipulate sounds using pre-recorded sequences directed to voicing and arpeggio parameters rather than note numbers. You may feel that you’ve seen this before (and you have) but Yamaha’s implementation is powerful; sequences can be stepped or smoothed, you can create up to eight sequences within a composite known as a Lane and combine up to four Lanes to modify a given Part, or use up to eight to modify a Performance. Think of this as sophisticated on-board automation, and you won’t go far wrong. Thirdly, the Montage offers 18 envelope followers that obtain their inputs from the output of the current Performance, from each of the Parts within it, or from the audio presented to the audio input. Their outputs can then be used as modulators or, if the beat can be extracted from the external audio, to synchronise things such as motion sequences and the arpeggiators and, therefore, multiple Parts to one another. There are hundreds of modulation destinations in the Montage (including many effects parameters) and, since the envelope of one Part can be used to affect the parameters of another, the possibilities are again almost endless. Although the Montage isn’t a workstation, it contains a basic MIDI Performance Recorder that allows you to record and store up to 64 Songs within the synth itself or in USB flash memory. The recorder offers 16 tracks corresponding to the 16 parts in a Performance, but there are no editing capabilities; it only allows you to record in real-time, with Replace, Overdub and Punch in/out modes. Once you’ve recorded a song, you can play it back on the Montage itself or record it to an attached memory stick as a 44.1kHz, 24-bit stereo WAV file. Interestingly, the synth will play other WAVs held on the stick, whether recorded from the Montage or not, and you can accompany these if you wish, but there’s no way to edit these or use them as the basis of sounds. For me, the greatest operational difference between using the Montage and its predecessors is the adoption of a touchscreen interface. To back this up, there are the usual editing controls — spinwheel, cursor buttons, up/down buttons and so on — and a plethora of other navigation and programming switches. There are also more than 30 Shift functions but, fortunately, these are shortcuts rather than unique functions. What’s missing is a numeric keypad. This is disappointing, although I can see that there would be little space for this on the 61-key version. To diminish the pain, you can display a virtual keypad on the screen for some parameters. One of the most obvious ways in which the Montage differs from its predecessors is in the central touchscreen interface. Most of the rest of the controls are dedicated to performance tasks. For example, the faders can mix Parts in a Performance, mix the eight Elements in a Part or (most interestingly) control the levels of the FM operators in an FM-X Part. But I would like to draw your attention to the Scene buttons lying beneath these faders. Each Performance can contain up to eight scenes within which you record snapshots of various parameters; pressing the buttons therefore allows you to jump between variations of the same underlying Parts. In simple cases, this can be useful when, for example, you want to bring certain sounds to the fore for a solo, or to modify the texture of an accompaniment as a track progresses. But there are other powerful uses for this, many associated with the ability to jump between arpeggio types and motion sequences. To experience this, select a drum Performance, switch on the Arpeggiator, and press a key. Now step through the scenes. The result is much like that obtained using KARMA scenes, although without the quasi-random variations in the patterns. The range of rhythms, grooves and fills that you can choose to place in the Scenes is immense, and certainly enough to build interesting songs, ranging from repetitive trance-y styles to more complex rock epics. There are two more facilities aimed primarily at live performance and, while neither is unique to Yamaha, they’re welcome nonetheless. The first is Seamless Sound Switching, which has been available on other manufacturer’s synths for many years, and is a welcome addition here. In principle, this allows you to switch between Performances without creating embarrassing silences while the DSPs reinitialise. However, it’s not quite as seamless as Yamaha promise; only Performances with Parts limited to slots 1 to 8 can be Seamless, and any significant changes in effects or uses of the arpeggiator or motion sequencer will cause discontinuities. The second is a Live Set function that allows you to recall Performances in a specified order without having to hunt through the Montage’s numerous sound banks or swap them around in memory. Adding sounds to a Live Set is trivial, and you can reorder the Performances within a given Live Set should you need to do so. Then, when you’re on stage, you can step through the Set using a footswitch, leaving your hands free to do the important stuff, ie. playing. Strangely, the Montage offers just eight keyboard zones — each with independent MIDI channels and control functions — whether directed toward playing internal sounds or externally for master keyboard purposes. This means that, while a Montage Performance contains up to 16 Parts, you cannot map all of them separately across the keyboard and access all of them individually. You might think that this would never be a problem but, when playing live, I often place numerous sound effects under individual keys at the top or bottom of the key range, and then split or layer various sounds such as pianos, organs and strings across zones occupying the rest of the keyboard. Consequently, there could be cases when I would have to use a 16-zone workstation in preference to the Montage. To be fair, I don’t view this as a deal-breaker; it’s just one more way in which the Montage demonstrates that it was designed to be used as a synthesizer rather than as a workstation. So, what about the sounds themselves? If you walk up to many modern synths at an exhibition, they’ll host a small selection of sounds that make you go ‘wow!’, followed by a few hundred that range from ‘useful’ to ‘I’m not sure how I would use that’ to ‘what pillock thought that that’s cool?’. It’s rare that you discover a synth that engages you on a different level, to the point that the security guards have to throw you out at the end of the afternoon. The Montage is one of those. Let’s start with AWM2 Parts. Once you’ve gotten to grips with their structure, you’ll realise that AWM2 is, in essence, just traditional subtractive synthesis, albeit with a huge range of parameters and myriad ways in which they can interact. Just think... an Element is a complete synthesizer, and a Part incorporates eight of these, and a Performance can comprise up to 16 Parts! In the past, you needed a computer-based editor to understand and get the best out of the system, but the touch-sensitive colour screen simplifies things greatly. Nevertheless, there’s nothing fundamentally new about many of the Montage’s AWM2 sounds — indeed, it includes all of the Motif XF’s preset voices as single-part performances, plus a GM bank. So there are acoustic pianos (including a new Bösendorfer Grand Imperial), electric pianos, organs of all shapes, guitars and basses, orchestral sounds, drums and chromatic percussion, a huge range of synths, pads and atmospheres... and much more, all grouped into 16 categories, each with eight sub-categories. I’m not going to try to describe how one amazingly complex and involving soundscape on this synth compares with a similar amazingly complex and involving soundscape on another... that would be an exercise in futility. I’ll just report that many of the AWM2 sounds are superb and that, whatever your musical and sonic tastes, you should be impressed with their range and quality. (The only area in which they don’t excel is in emulating big, vintage analogue monosynth sounds. But you can’t blame it for that; if you want something that sounds like it’s held together by mismatched screws and gaffa tape, you should get the right tool for the job.) Before moving on, it’s worth noting that you can load Motif library files into the internal flash RAM, and that these can include Performances, Arpeggios, Motion Sequences, Live Sets and... additional waveforms! Again, this doesn’t imply that the Montage can sample, but the unexpected ability to load new PCM data extends its possibilities even further. Moving on to the factory-programmed FM-X sounds, these concentrate as expected on established FM strengths such as electric pianos, basses, brass, chimes and percussive instruments such as picked guitars and eastern stringed instruments. This is a shame, because the engine is capable of so much more. Perhaps this concentration on FM’s legacy is a consequence of Yamaha’s programmers making the Montage compatible with the DX7, DX7II, TX802 and TX816 via a patch converter that translates original FM sounds into FM-X versions. (To be fair, I’m rather pleased by this; it means that someone can — and probably will — recreate the wonderful TX816 library on the Montage.) But I hope that owners will make the effort to explore beyond these sounds; when I stepped through the factory Performances, I was stunned to see how underused FM-X is when compared with AWM2. Despite it undoubted strengths, there are a couple of areas in which I think that the Montage could do better. The first is, for the most part, just a niggle and easily corrected. When auditioning the factory sounds I found that the tones of most AWM2 Parts transitioned smoothly from ppp to fff, which is commendable. Unfortunately, some — the Celtic Violin is a prime example — exhibit huge leaps between velocity layers, which greatly limits their usefulness. This is strange, because AWM2 allows you to crossfade between Elements, so it takes just moments to correct this. Happily, most of the AWM2 sounds are also smooth as you play up and down the keyboard and, while a few exhibit minor inconsistencies, these are not objectionable. The second is (for me, at least) more of a problem. The Montage 6’s and 7’s semi-weighted keyboard is both velocity-sensitive (with five selectable curves) and aftertouch-sensitive, which is good news. But if you’re planning to buy one of these, there’s something you should be aware of. I have a particular liking for instruments with 76-note semi-weighted keyboards, so imagine my surprise when something felt a tad wrong when I started to play it. It wasn’t the throw of the keys, nor the slightly spongy response that I suspect will loosen up with time: it was the perennial issue of Yamaha’s slightly narrow keybeds. A full-size 76-note keybed ranging from E to G is 1060mm wide, whereas the Montage’s extends to just 1033mm, which (in old money) is about an inch too narrow. It doesn’t sound like much, by my fingers noticed it even though my eyes didn’t. I have no idea why Yamaha do this, and I wish that they would stop because, if I want to stack multiple manufacturers’ keyboards in a live rig, I want them to line up. For me, a discrepancy of about 1.5 keys from bottom to top is serious, and trained pianists are at risk of playing ninths when reaching for octaves. It may seem a small difference, and it may even be irrelevant to you, but it’s one that you should consider before handing over your cash. So finally we come to the thorny issue of price. Despite one being a synth and the other a workstation, I suspect that the most direct competition for the Montage will prove to be the Korg Kronos rather than, say, the more affordable Kurzweil PC3K series or any of the modern breed of analogue polysynths. I’ve read elsewhere that this isn’t a sensible comparison because the Kronos isn’t a PCM+FM synthesizer, but that’s rubbish. You can compare each of its facilities with those of the Montage, including any sounds that you create using a combination of its HD-1 (PCM) and VPM (FM) sound engines. Both instruments look gorgeous and provide first-class sound quality, so maybe the comparison has to be on a ‘features per pound’ basis, and this is where I run into difficulties. 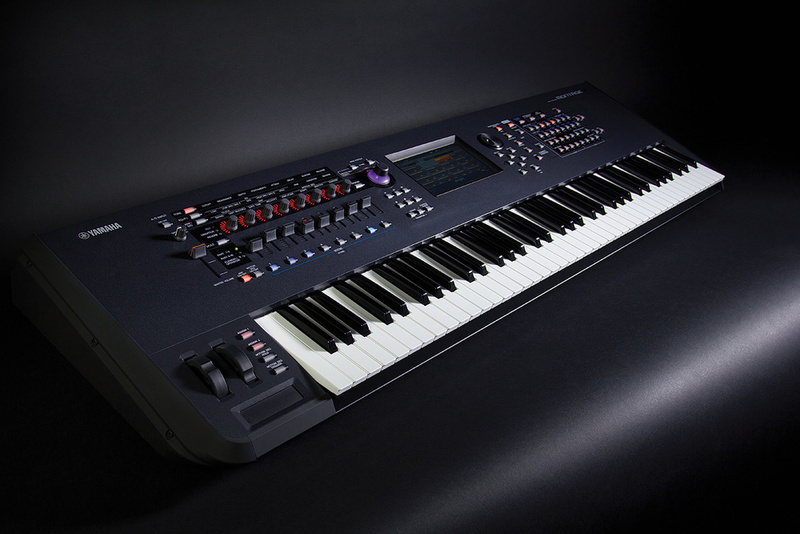 Ignoring any preference for either instrument, the Kronos offers nine sound engines (including physically modelled electric pianos, organs, synths and strings) rather than two, plus KARMA, digital I/O, sampling, and a full audio/MIDI sequencing package on which you can play and record finished tracks replete with guitars, vocals and, if desired, Polynesian nose flutes. Given that each model of the Kronos retails for a few hundred pounds less than its Montage equivalent, it’s hard to see how the Montage can compete. Of course, there will be some who prefer its sounds and programming system, and others for whom the Korg’s additional facilities are irrelevant, and yet more who are drawn to the Montage simply because it’s a gorgeous synth. But I can’t help feeling that it’s just a tad too pricey to recommend it unreservedly. The synth world has been looking backward for many years, with hardware recreations of Minimoogs, Odysseys, Prophets and Oberheims, plus dozens of soft synths and modules emulating almost everything of value from the ’60s, ’70s and ’80s. In part, the Montage shares this philosophy, drawing upon Yamaha’s legacies, although it considerably extends the underlying technologies, looks and feels like a thoroughly modern synth, and its sparkling, detailed sound is entirely contemporary. Indeed, the possibilities hidden behind its slightly daunting programming system are exceptional. I’ve been testing the review unit for a few weeks and, since the upgrade to v1.5, I’m still finding new pages, new capabilities, and new ways to do things. Were it not for its slightly narrow keyboard, I think that I might be tempted to give it an unequivocal ‘thumbs up’. But I can’t help wondering whether it can succeed at its current price. I hope that it does because, as you can tell, I rather like it. The rear panel of the Montage is more sparse than you might expect, with only four audio outputs; balanced TRS sockets, grouped as main and auxiliary stereo pairs. Given the multitimbral effects structure, eight or even 16 of these pairs wouldn’t have gone amiss although, again, perhaps that’s more of a workstation feature than a synthesizer feature. Alongside these, a stereo headphone output offers the same signal as the main stereo pair. To the right of the outputs (looking from the rear) you’ll find a pair of mic/line audio inputs that allow the Montage to receive external audio signals and apply effects and EQ to these. You can also use external audio as the modulator in the synth’s vocoder effect. To the left, you’ll find MIDI in/out/thru on standard five-pin DIN sockets and two USB 3 sockets — a Type A for external flash memory (although not USB hard drives, hubs or other devices), and a Type B for audio and MIDI transfer (128 MIDI channels configured as eight ports of 16 channels each) between the Montage and a computer. There are four pedal inputs; two for pedal switches (one predefined as a sustain pedal) and two assignable inputs for expression pedals. The final hole in the rear panel is for an IEC mains cable. While there’s an associated on/off switch alongside this, a user definable auto-power-off function will also switch the synth off if it’s left untouched for a while. What you won’t find — externally or internally — are any physical expansion options such as slots for additional memory, expansion cards, direct digital outputs or Wi-Fi. It seems that Yamaha’s engineers view the Montage as complete. Although not a workstation itself, the Montage will talk to workstation software running on your Mac or PC. The key to this is Montage Connect, which runs as a stand-alone application or as a VST3 or AU plug-in, allowing you to transfer Performance data and Song data (as MID files) between devices. Once a song has been imported into the computer, you’re free to edit it using the workstation software but, unfortunately, it doesn’t seem possible to return the modified Song to the Montage itself — you’re limited to playing it back via MIDI in the usual fashion. Montage Connect requires a Mac running OS 10.9 or later, or a PC running Windows 7 or later, together with Yamaha’s Steinberg USB driver and suitable DAW software such as the bundled Cubase AI 8. The Montage can also be used with iOS devices if you have Apple’s Lightning/USB Camera Adapter. I was recently taken to task for criticising some synths for their lack of digital audio I/O while allowing others to get away with the same omission. However, those I criticise are digital synths within which the audio signals are already digital, while those that I don’t tend to be synths with uninterrupted analogue signal paths. I’m therefore pleased to find that the Montage offers extensive digital audio I/O via USB, allowing you to send all 16 stereo Parts (32 channels) as individual 44.1kHz channels, and to receive three stereo signals. Alternatively, you can use higher sample rates (48kHz, 96kHz or 192kHz), but you’re then limited to sending four stereo channels and receiving three. Nonetheless, the lack of conventional digital audio outputs (optical or S/PDIF) echoing the analogue I/O pairs is disappointing. It looks and feels gorgeous. 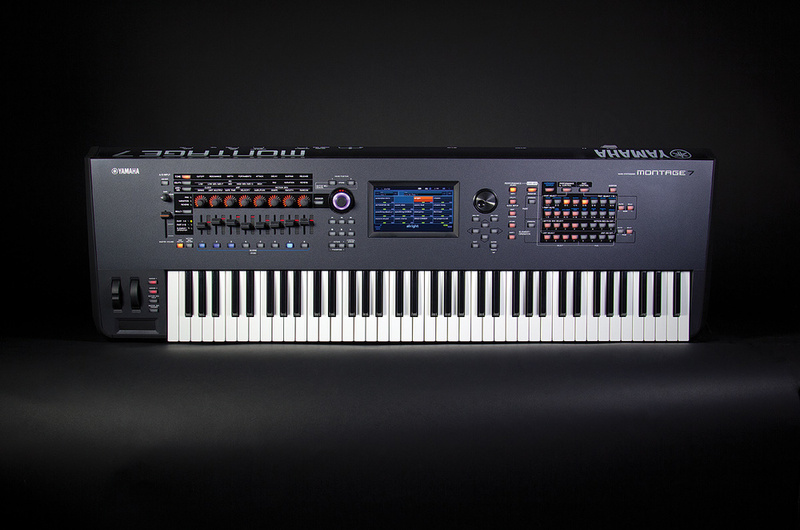 It offers two powerful synth engines in a single synth with up to 256-voice polyphony. AWM2 now sounds better than ever and FM-X will be a revelation for those not acquainted with the FS1R. The drum sounds and arpeggios are first-class. It has a multi-timbral effects structure. It offers huge modulation and control capabilities. The touchscreen and GUI are big steps forward for Yamaha. You’ll never run out of new sounds and new things to try. It’s compatible with the Motif series and vintage FM synths. The Montage 6 and Montage 7 have slightly narrower keybeds than standard. More analogue outputs would be useful. It has no digital audio outputs, and offers no expansion options. It’s not cheap — and neither should it be — but it may be a bit too pricey. A flagship synth with a price to match, the Montage is an excellent instrument that will keep sound designers and players interested for a very long time to come. Montage 7 £2985, Montage 6 £2559, Montage 8 £3412. Prices include VAT. Montage 7 $3499.99, Montage 6 $2999.99, Montage 8 $3999.99.